The brand new "Newbury Street" elevator dress shoes, handcrafted in Italy features a special shiny black upper with elegant suede details. The soft inner lining is made of goatskin. The insole and outsole are in genuine Italian leather, assembled by hand with special anti-slip rubber. 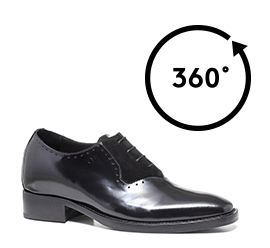 The height insole of the Newbury Street can be chosen between 2.4, 2.7 and 3.1 inches. With their ultra comfort and the extreme value of the leather and materials used, the Newbury Street are recommended for the most formal ceremonies and events.